Yep, they were turning yellow alright, but it wasn’t due to a lack of nutrients or too much water or a disease. As I began to examine the leaves more closely, the overwhelming stippling and leaf bronzing were clues to indicate the culprit. The very fine webbing, enclosing the leaves, along with the stippling and bronzing of the leaves, is all consistent with the explosion of one of the major pests of greenhouses, which a high tunnel is considered to be, the two-spotted spider mite! Wow, the populations were so high that not only could you see them in the webbing, but they shut the plants down entirely, very rapidly. The other problem with trying to manage population this high, the extensive webbing can act to protect and shelter the mites from being affected and impacted by pesticides. One has to actually disrupt the continuity of the webbing to be able to help place the pesticide product in such a way that it will impact the mite populations. 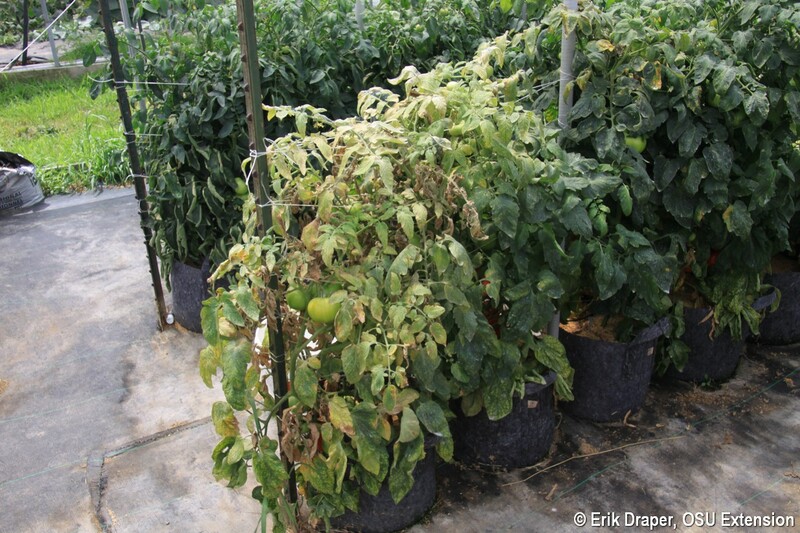 Hoping that the pest just mite go away in the hot, dry conditions in the high tunnel… is a bad approach!